I am a firm believer that asynchronous (Jive Software/Social) and synchronous (Cisco/Unified Communications) collaboration are bigger than the sum of their parts. To be able to move between the two seamlessly removes one of the biggest media breaks in my daily work. I’ve been invested in this topic since around 1998 when one of my first jobs was to build an integration between a Lotus Notes application and a Siemens CTI system. One of the first things I built when dabbling around with early versions of the Jive Apps framework was integrating voice and messaging into Jive social business platform (Jive Apps Developer Community: Here there be dragons: Creating a VOIP Telephony Jive App using Twillio and Microsoft Azu…for a trip down memory lane). We at Pokeshot/SMZ started building Jive features like our Cisco Jabber integration right after we founded the company in 2012 (and are now happily discontinuing it in favor of the official integration coming from Jive and Cisco). Yes, we are absolutely thrilled about this partnership. If Jive and Cisco execute right on this, I’m sure there are some amazing things awaiting us in the next year on the Jive roadmap. Once you have those fundamentals in place, you can start thinking about how this base technology can be adapted to support processes on a personal and organizational level. Start with something simple. One of my favorite examples for this is the integration of audio and web conferencing into Jive social business communities. Imagine having a weekly call with your large project team. Rather than going into Outlook, setting up a conference call and online meeting, and then sending out invites to a member list you maintain, you simply schedule the meeting in your project space, and all active members get the invite automatically. No more manual updates to email distribution lists, no more former project members still receiving invites, and you just saved 5 minutes of your time. A simple example, admittedly, that barely scratches the surface, but one that anyone can relate to. These are the first steps on the Jive roadmap towards tying the Jive social business platform into more business processes, beyond collaboration. Purposeful place will deserve their name even more. Lets not overlook, however, that this partnership is not without it’s challenges. Cisco is a $50 Billion company selling primarily to IT. Jive’s 2013 revenue is roughly 0.3% of Cisco’s. So for most Cisco sales selling a 3rd party product is not going to be high on their agenda, given Cisco’s massive product portfolio. 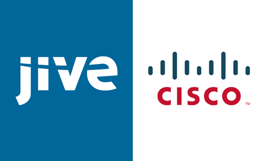 If you go to www.cisco.com you will not find any mention of this partnership or Jive Software, even when searching for it. Also Cisco is selling mostly to IT, whereas Jive is still a sale to the business in many cases. Jive is also giving up some of it’s credentials as the only major independent social business vendor on the market. Aligning with Cisco potentially takes some of that independence away. Integrating with Cisco’s Unified Communications portfolio, will also take some significant engineering resources, as (despite the name) the portfolio is far from unified, consisting of various products with at least four distinct APIs. Also, let’s not forget that while the very impressive integration of Unified Communications into Webex Social looked great in presentations, actual end-user adoption was lackluster. Most customers we talked preferred to use the standalone Jabber client, and used little functionality besides integrated presence indicators. To get adoption beyond pure presence integration, Jive and Cisco have some interesting UX challenges to overcome. I can’t wait to see what will be presented at JiveWorld14 and after. I am keeping my fingers crossed, that Jive and Cisco get this right. If you look at two of the main competitors to this partnership (IBM Connections+Sametime and Microsoft Yammer/Sharepoint + Lync), these players haven’t really done much, besides simplistic presence and click to call integrations. Here’s hoping that Jive’s awesome UX team and Cisco’s technology will deliver something richer and more visionary. Their certainly the team I would bet one.